Hunting games have never really taken off. Recently, hunting as an optional activity in games has become increasingly popular, with Assassin's Creed 3, Far Cry 3 and Tomb Raider in the last year alone, all using fantastic hunting systems. But standalone hunting titles, there's just something about them. They usually look and feel dated. They never seem to fully utilise what the current consoles have to offer, and for every aspect of it you like, there are two that you hate. The latest entry into the hunting genre is Hunter's Trophy 2: America, from developers Kylotonn. Is this the hunting game we've been waiting for? Or is it just another dated disappointment? Read on for the full verdict! It's the hunting season, and you have just scored your first hunting permit! So now you can take part in a hunt in one of five regions: Alaska, Alberta, Colorado, Kentucky and Wyoming. 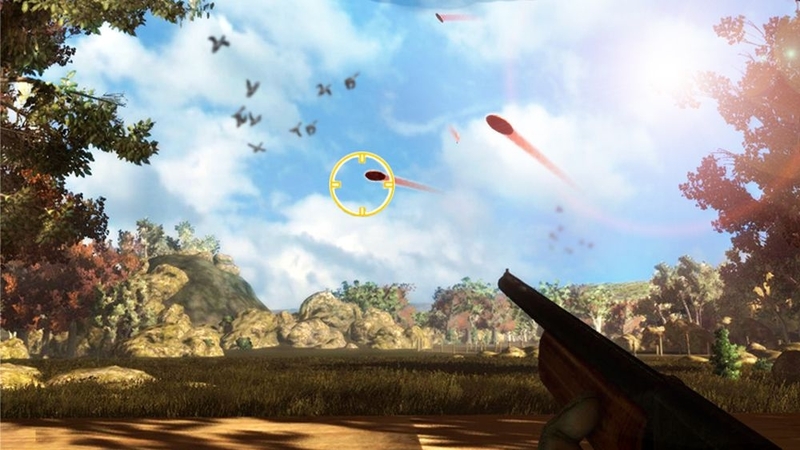 Each one has it's own environment, from snowy mountains to lush forests and lakes, and you will find different animals to hunt at each location. You must use certain tracking techniques as well as careful stealth to get into the perfect position to take down an animal. To help you with the hunting, you are given a highly trained tracking dog. When the dog comes into play, you actually control it, and you must pick up scents and trails to follow, to discover where the animals currently are. It's a really nice touch, and playing as the dog is definitely fun, but every time you use the dog, it's exactly the same system. Smell a couple of scents to make the trail appear, follow the trail, call for your master. There is no variation, so pretty soon after you unlock the dog, it seems like more of a chore than fun. A lot of potential was missed with this feature. As you start a hunt, you are given a specific task. These vary from tracking and killing the animal yourself, flushing out ducks and geese into the open airs, killing as many of a certain animal as you can, etc. They are pretty standard, but there is at least some variety to keep the gameplay mixed up a little. Once you complete your hunt, you will gain exp for completing the mission, as well as for any optional "pests" you have killed. Levelling up is actually one of the good aspects of the game, as you unlock many different items, outfits, locations and skills, and it does take a good few hours to unlock them all. Some of the sections require you to stand in one spot, with no movement available, and play like it's a Duck Hunt style shooter. The controls for these bits are way too sensitive, and it can get incredibly hard to aim accurately. It's an even worse problem when you look down the sights of your guns. The aiming changes to the reticule moving around the entire screen, instead of the reticule staying central for the moving camera. Let go of the analogue stick and the reticule returns to the middle. It makes it very hard to shoot animals at a distance, when it's impossible to make minor adjustments to your aim. Graphically, it is nothing to shout about, but Kylotonn have put in a decent effort, when you take into account that this is a digital game that costs less than £10, so the budget can't have been that high. The character model is not too bad, a gruff looking, stereotypical mountain man, with the clothes to match. The weapons, whilst very basic looking, also look good up close. Visually, the trees and plants are the most impressive. The grass is particularly nice, with gorgeous, lush meadows and thick, long grass. The various lakes and rivers are also a treat for the eyes. The animals are also decent enough to look at, but they are let down by dodgy AI. It seems like the pests in each level spawn, and then run in a perfect straight line until something in the environment blocks it. The amount of times I've seen a raccoon running at full speed whilst slowly sliding around a rock is ridiculous. So there we have it. 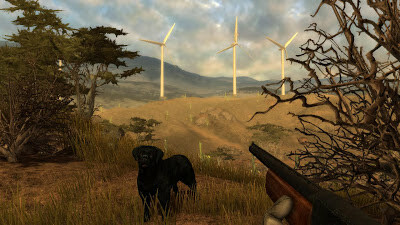 Hunter's Trophy 2: America does not redefine the genre, it merely backs up the idea that all hunting games have a much lower level of quality than most other genres. In comparison to other hunting games, it's a solid effort, so fans of other hunting franchises will more than likely enjoy it. If you're not a fan though, it will be fun only for a little while. Kylotonn should receive some praise though; the inclusion of the controllable dog is a great idea, and the levelling up/unlock system is put to fantastic use. But generally, this game will only be enjoyed by a very specific demographic.